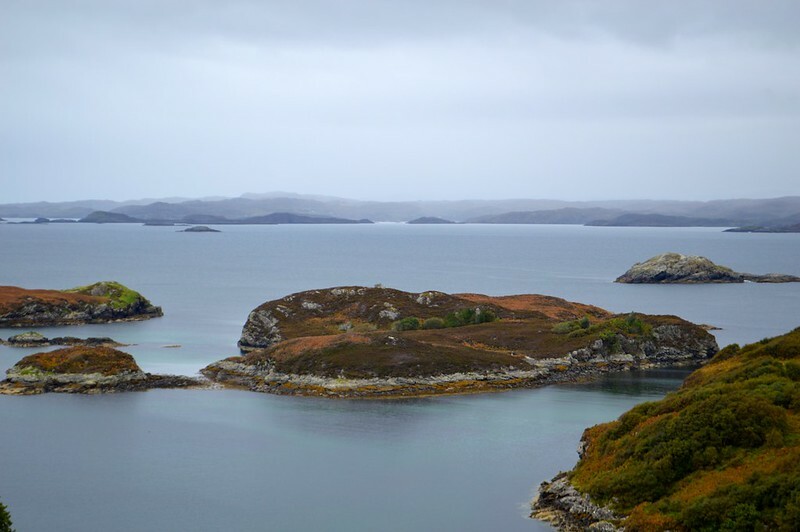 I hope you're not bored of reading about my Scottish honeymoon because there are two posts left in the series and a lot of photos of blue skies and white sand beaches to share with you. 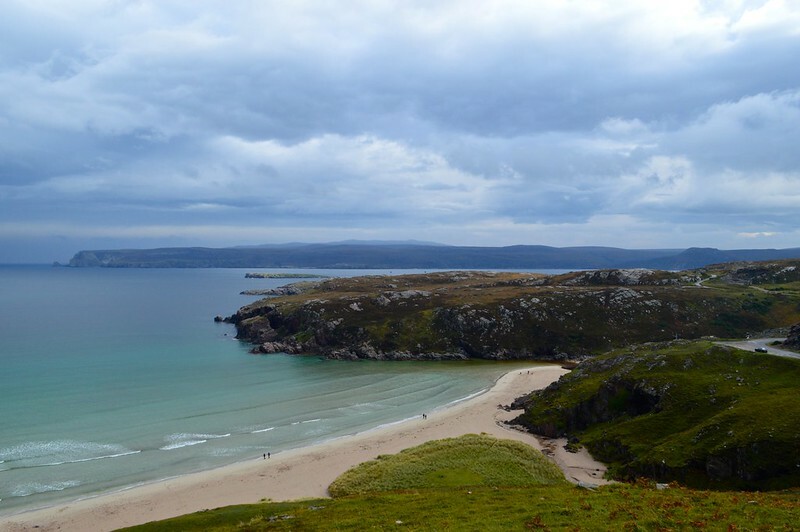 After setting off from Ullapool early in the morning we headed to Durness via Clachtoll and Drumbeg. This was another spectacular section of the North coast 500 route with amazing views but we actually found this section a bit hair raising. The 24-mile-long single track loop that follows the coast was narrow, twisting and steep but don't be put off because it is incredibly scenic. 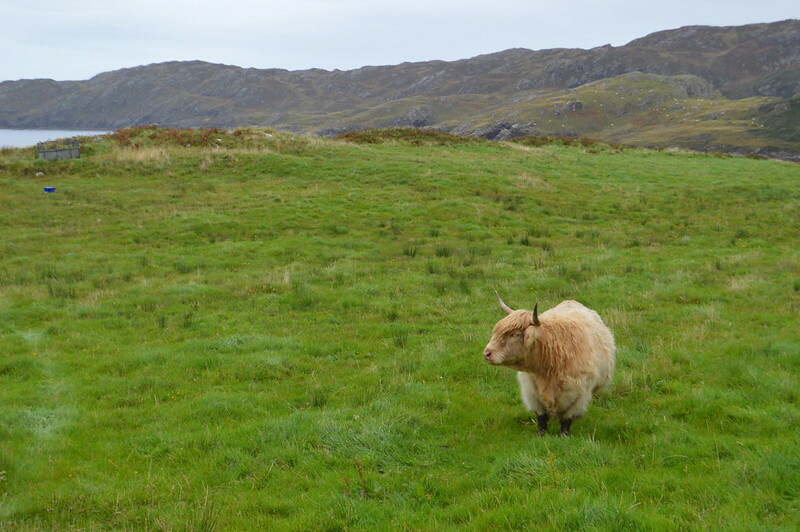 There's lots to see on the way to Durness including Stoer lighthouse and the Old Man of Stoer which is an impressive 60ft high sea stack. The drive was difficult with a lot of steep climbs and poor visibility all on narrow, single track roads. I did feel for Martyn who did all the driving on the trip as this section was gruelling, I held onto the seat and our dog Coco for the duration of the journey, lots of pit stops and beach walks broke up the journey and allowed us to enjoy this section. 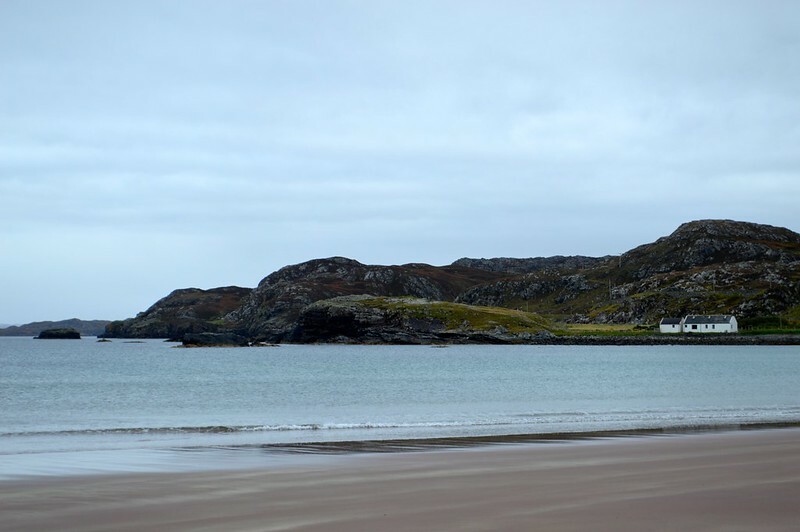 Clachtoll Beach is a popular beach close to a campsite (and a free car park and toilets) with some rugged terrain. The water was turquoise and the sand so white and clean. We were the only people on the beach in the middle of the day and enjoyed stunning mountain views for miles around before it started to rain so we headed back to the camper van for a cup of tea and lunch before hitting the road again. 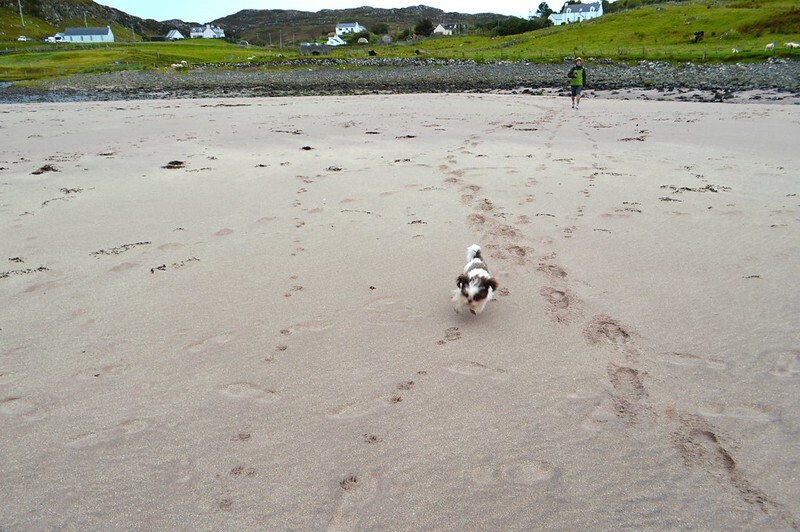 We stopped off at a few beautiful beaches on the way to let Coco stretch his legs and get some exercise. He loved digging up sand and running away from the cold water as the waves came in. We met a lovely lady on the beach who told us all about the local Viking history, the Gaelic school system in the area and the affects that the NC500 fame is having on the area. Whilst many people in the area encourage tourism and enjoy the benefits I get the feeling things are getting a little tense Some tourists are not being respectful of the landscape, don't allow locals to pass at passing points on the single track roads and are becoming a nuisance. 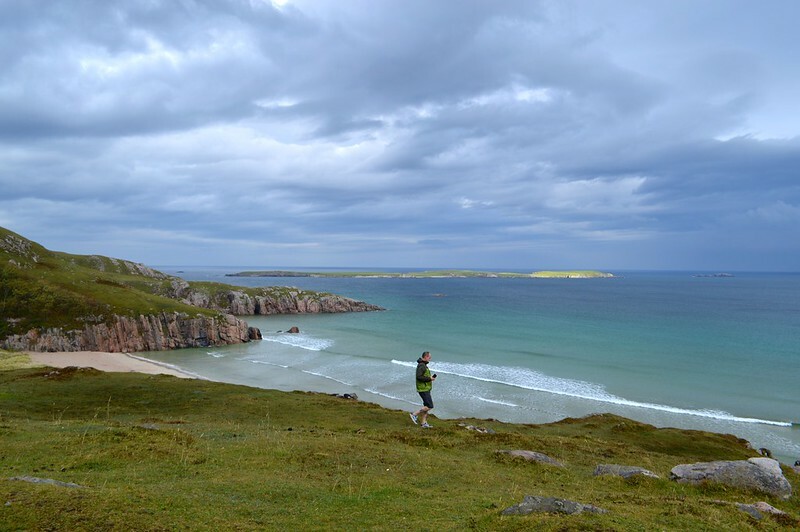 The infrastructure hasn't quite caught up with the demand and people are not deviating from the North Coast 500 route and exploring other areas meaning that not all businesses are benefiting from the current surge in popularity that this route is experiencing. *Preaching time* If you're thinking of visiting the north of Scotland please make sure you support local businesses and don't just stock up in the the major towns and big supermarkets, read this driving guide and leave the land as you found it so others can experience unspoilt landscapes. 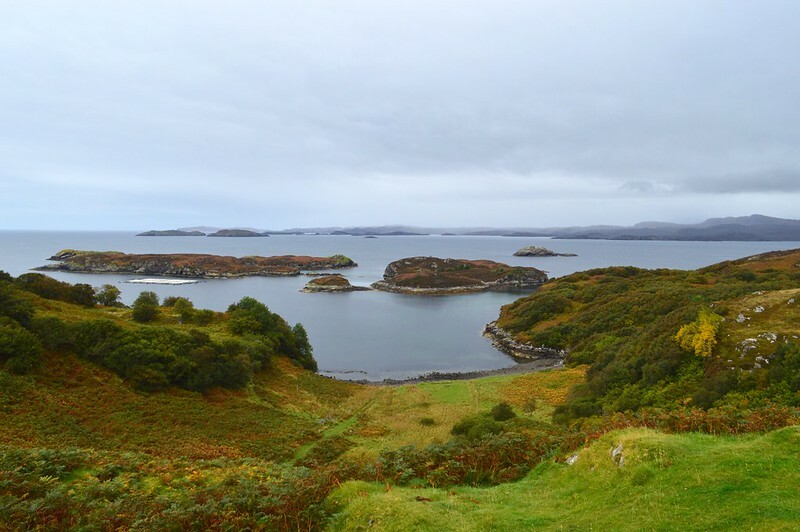 The village of Drumbeg lies on the north coast of Assynt, looking out across Eddrachillis Bay to Handa Island and the mountains of Sutherland. There is a viewpoint with a car park where you can admire the magnificent seascapes. After a stressful drive we arrived in the perfectly located Sango Sands Oasis campsite. Sango Sands is a peaceful, ten-acre site overlooking the beautiful Blue Flag Sango Bay beach. 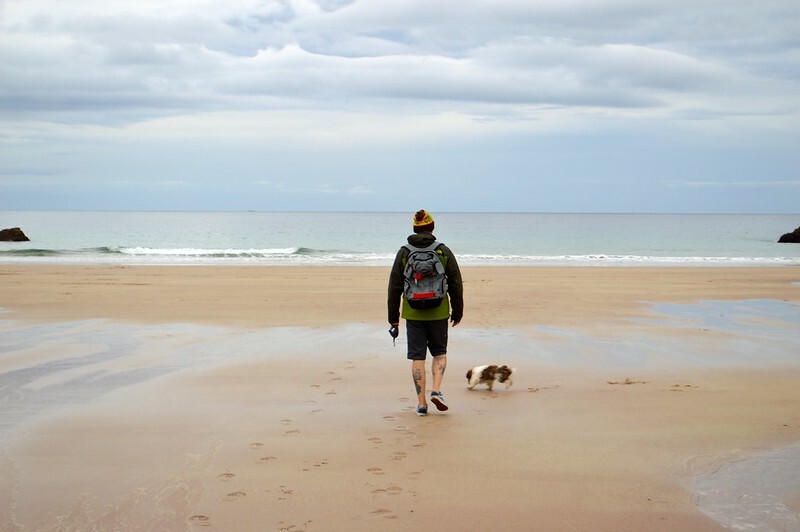 The site has basic facilities much like most in the north of Scotland but has everything you need including an on site bar/restaurant, electric hook ups and laundry facilities. It was around £9 per person plus £4 for hook up. Very reasonable in comparison to sites in Loch Lomond which were £35+ a night plus extra for dogs. 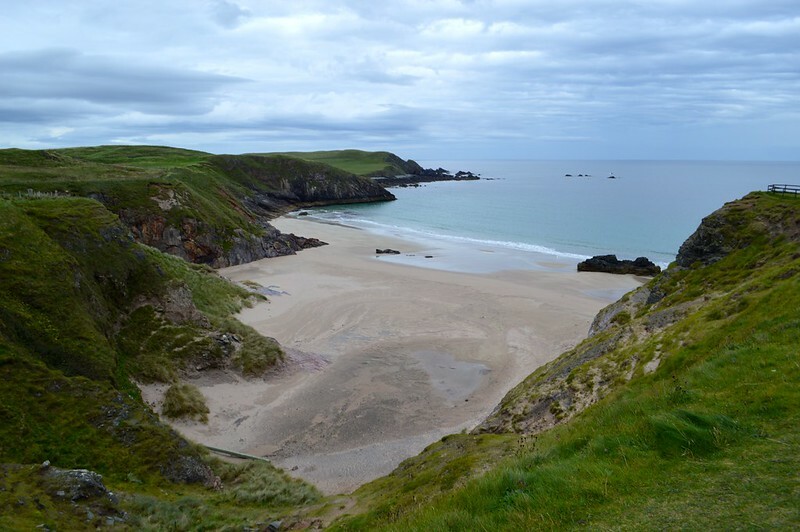 Sango Bay offers panoramic views of the North Minch - the channel between the mainland and the Hebrides. 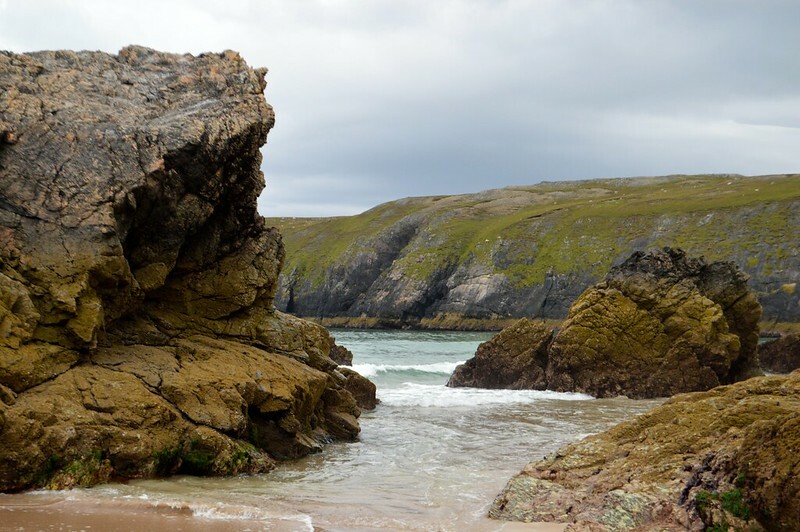 With golden sands and dramatic rock formations Sango Sands is breathtaking. The spot we parked up in at the campsite had views over the bay and I would never get bored of waking up to this. A short distance to the east of the Sango Bay is the famous Smoo Cave. 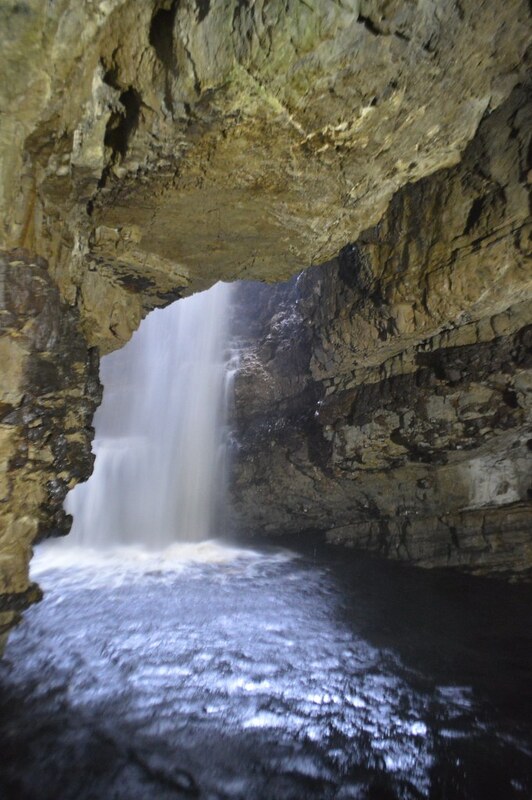 The largest cave in Scotland, it was formed by both the sea and a river. The cave can be explored on foot or by boat in peak season. The cave boasts a 50ft high opening and is floodlit inside to reveal its depths. 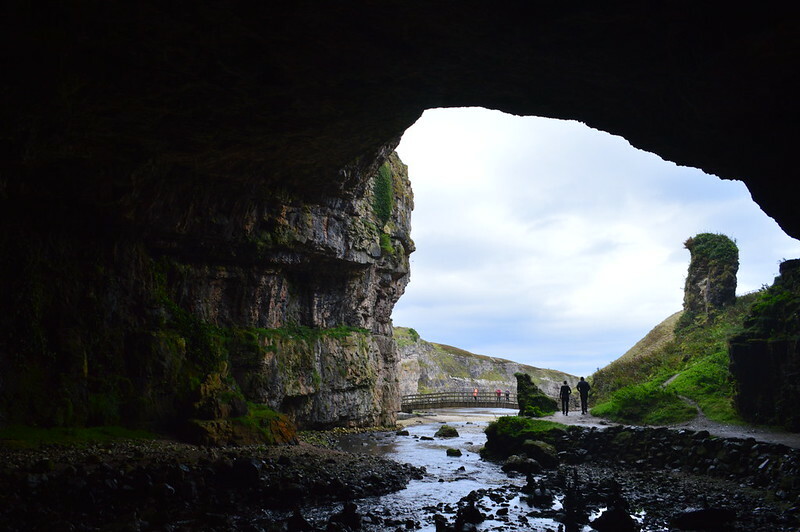 The cave name is thought to originate from the Norse 'smjugg' or 'smuga' meaning a hole or hiding-place. The caves are said to be haunted and legends and myths say that the devil once hid in these caves. You can read more about the interesting and dark history of the caves here. That's it for the North coast of Scotland. We headed to Thurso the next day and drove along the beautiful east coast to Inverness and then across to the West coast because we are a bit mad and thought a full day of driving would be a good idea. The scenery changed completely, much less dramatic, rural and remote and it became flatter, more populated but still full of interest in the form of castles and distilleries. My final post about our honeymoon road trip will feature a stunning castle and an marvel of industrial engineering. Pop back next week to read more! Oh that looks beautiful! We've been talking about taking the kids camping there, it's a bit of a trek for us as we're in Cornwall but hopefully we'll manage it next year. I have enjoyed reading these so much Gem! Your honeymoon looked amazing. What a trip to be able to have taken. Love seeing all the pictures!! They are awesome! Oh wow your honeymoon looks amazing and fabulous photographs. What an amazing trip you had. My husband and I did something similar before we got married, I can't imagine doing it since we had our children! Everything looks so beautiful. I've wanted to visit Scotland for ages, and a road trip is a great way to do it. Cool pictures. Thanks for sharing the post.